The middle book of Jim Fitzgerald’s memoir-trilogy picks up right where Book I left off. It is 1976, he’s now a sworn police officer in the Philadelphia suburb of Bensalem Township and is about to embark on his next life-journey. Experience the investigations, arrests, prosecutions, politics, and numerous bizarre people on both sides of the badge and gun. These include criminals, local politicians, and even fellow cops, sometimes all rolled into one. Join Jim as he progresses through the ranks from patrolman, to plainclothes officer, to detective, to detective sergeant and patrol sergeant on this non-stop ride through the ups and downs and triumphs and tragedies of his 11 years as a law enforcement officer in his, at the time, very dysfunctional police department. A Journey to the Center of the Mind: Book II is now available on Amazon and it is already getting some great reviews! If you ever wanted to know what it’s like to be a police officer, read this book. With an amazing ability to recall events, Jim Fitzgerald presents the intriguing details of his initial entry into law enforcement as a rookie and the trials and tribulations he encounters as he advances up the career ladder in the department and beyond . . . Great job Jim! Once again, retired FBI Special Agent James Fitzgerald is engaging as he carries the reader on an insightful journey closer to the center of a criminal profiler’s mind. His depictions of his police career are sometimes funny, sometimes sad, but always engrossing and insightful. 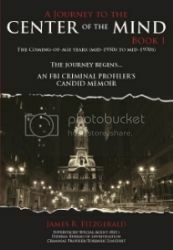 From routine patrol duties, to undercover and plain clothes assignments, Fitzgerald aptly portrays the formation of a future criminal profiler’s psyche and what it feels like to be a police officer, confronting not only the criminal element but also administrative politics that affect all police officers everywhere. His compassion for victims and his integrity as a police officer elicits a warm feeling as the reader gains a rare perspective of this side of police work. His story is honest, intelligent and masterfully written. A must-read for anyone who is contemplating police work as a career!